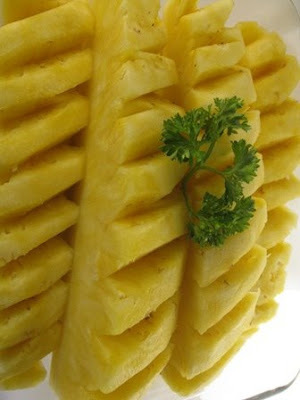 Pineapple is abundant in tropical countries like Asia and South America. When we feel like eating fresh pineapple,we can just go to any food court or road side vendor stall to get a pieces or two. But living in US,we don't have this luxury..Either we get the whole pineapple from supermarket or pineapple with juice in can. 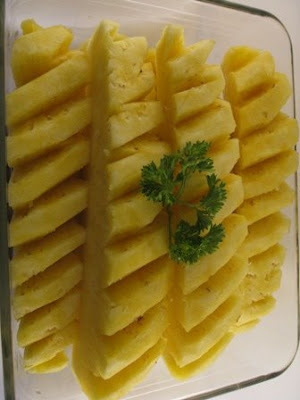 I know as a Malaysian we sometimes miss eating pineapple or any exotic fresh fruit from home..The best we can do is to cut the pineapple our self ..Actually cutting pineapple is not really difficult at all..I understand some people claimed that pineapple has benefits for some intestinal disorders; others claim that it helps to induce childbirth when a baby is overdue. But for me I eat it because I love the sweet and sourly flavor and juicy texture! 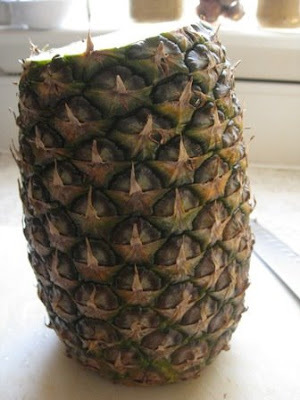 remove both top and bottom end of the pineapple. 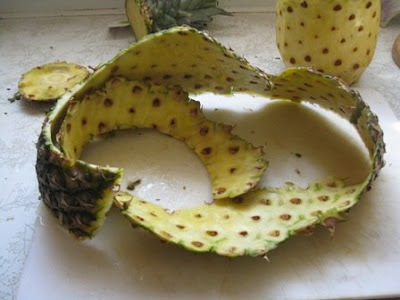 Remove the shell/skin first-do not cut too deep or else you lost all the great flesh on it. Then use right hand to hold knife,left hand to hold the fruit tightly.Remove the "eyes" of the fruit until gone.Hold your knife 90 degree angle when cutting. Do not consume the "eyes" !! It's will make your tongue itchy!! Taaaa....dah!! 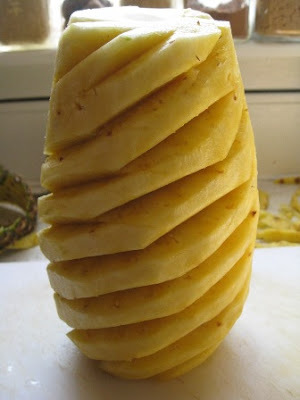 a prefect cut whole pineapple!! Wash with clean cold water before cut to 8 pieces. Sometime,I just sprinkle some salt on it to eat or most of the time I mix with spicy fruit salad (rojak)!! Stay tune for my Rojak recipe!! Meanwhile you can enjoy my video of cutting pineapple below! I grab hubby to tape this video when I just start cutting pineapple...He not the best photographer/videographer but I think this video is not bad at all.. Enjoy the show!! Wonderful Video...thanks for showing us! thank you for the nice video - what are the next steps? Oh,sorry, I haven't noticed the further recommendations at first. Now it's clear! Thank you! My mom uses the pineapple top to propagate pineapple. Just place them in a pot of soil and water daily. 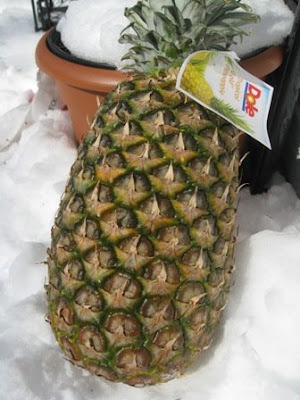 You will be able to grow your own pineapple in the garden. 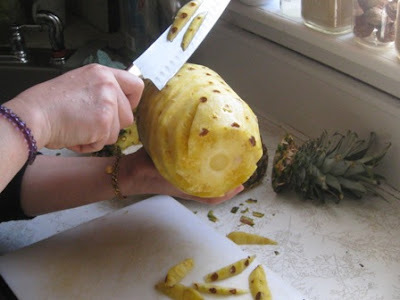 What a gorgeous way to cut a pineapple - it looks so gourmet! 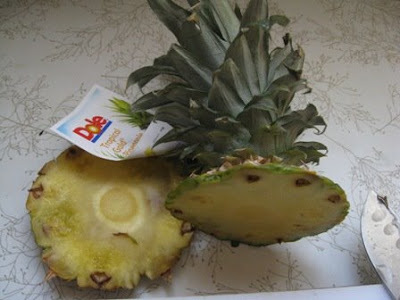 Thanks for posting - I could not find many sites that show how to cut pineapple this way, the "asian" way. Will share with non-asians!